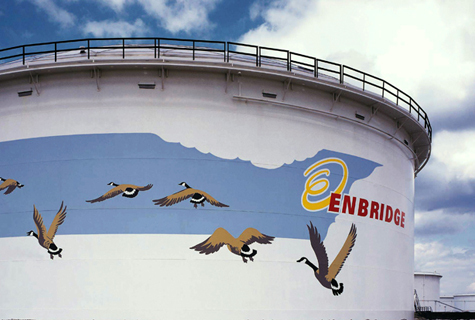 In spite of the fact that at least some of Enbridge's oil tanks are decorated with illustrations of Canada Geese in flight, oil tankers and birds are a deadly combination. Almost all the largest oil companies are currently mining and drilling in the Boreal forest and wetlands where more than half of the birds of North America nest. According to the National Resources Defence Council's December 2008 report, Danger in the Nursery: Impact on Birds of Tar Sands Oil Development in Canada’s Boreal Forest, over the next 30 to 50 years between 6 million and 166 million birds will be lost as a result of tar sands development. global warming (the tar sands are Canada’s fastest growing source of greenhouse gas emissions) affects migratory birds that may arrive too late to find food because insects emerge earlier in the spring. And birds that hoard food to get through the winter so they can start feeding their young in the spring may find that the food spoils before the first freeze. PLEASE HELP STOP OIL TANKERS IN BC. Dogwood has mounted a massive campaign to stop oil tankers in BC waters. Every name on the petition will help. Thank you. Please tell your friends too! Hi. I'm Sharon. When my husband and I moved to Gabriola Island in 2007, I couldn't tell a rooster from a robin. (Well, that's a slight exaggeration.) But now I can - and this blog is a way for me to share my interest in and love of wild birds with you. Welcome & enjoy! 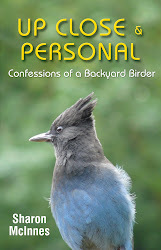 To read review of Up Close & Personal, click on book. $12.95 + 3.95 S/H. Also available at Village Foods on Gabriola Island. To follow this blog, please type your email address in the box. All material is copyright Sharon McInnes.. Watermark theme. Powered by Blogger.